The colder winter days brings new work for our many residents associations with the cleaning of planted areas. Beds where possible have a variety of sustainable plants that give colour all year round. These need to be weeded, the plants trimmed back, or in many cases divided and replanted elsewhere. 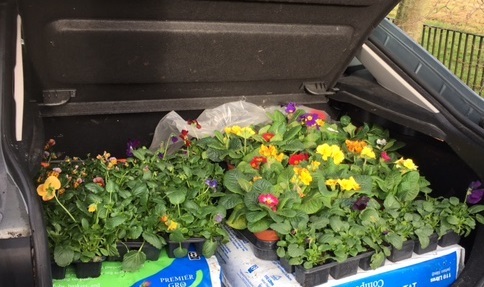 Some winter colour is add with primroses and violas. 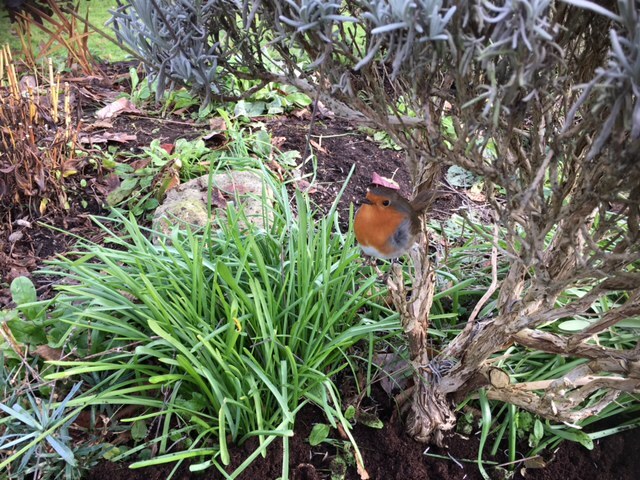 The robin, a gardeners friend in the winter stands by, ready to pick up any tasty morsels which remain after the work. Congratulations to Birdwatch Ireland, there has been a confirmed sighting of the Great spotted woodpecker to the western side of Kilkenny City. This is great news for our City. Extensive work has been undertaken over many years to improve and extend tree cover and woodland in Kilkenny. This is creating a habitat suitable for the wood pecker. 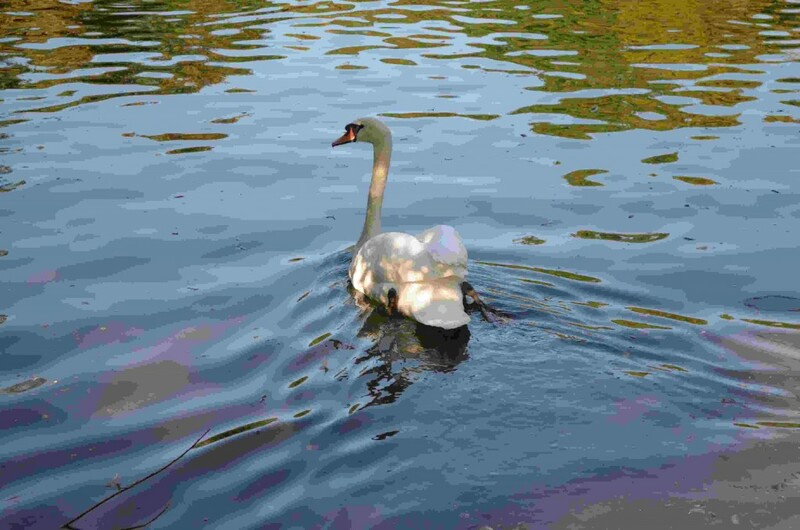 Bud, a long term resident Swan of the Castle pond decided to fly out of the park and then go walk about in the last few days. A phone call from a local resident had reported a sighting of Bud in her garden. Mr Pat Durkin of Bird watch Ireland was joined by members of the KKB to find Bud. A search followed which found nothing but feathers. Later in the day Bud turned up in Dukesmeadows. Bud walked back with a large crowd from Dukesmeadows under the watchful direction of Pat Durkin. 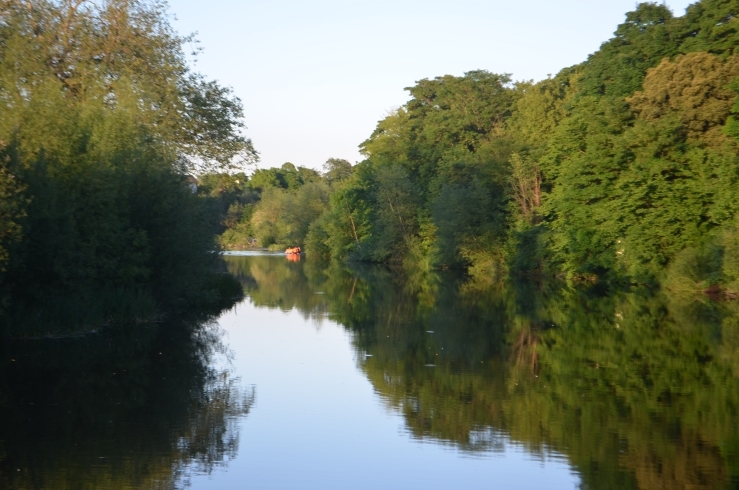 Kilkenny is fortunate to have a number of very attractive lake and marsh habitats within the City. Lakeside is currently springing to life. to assist the wild fowl a floating nesting area has been put in place and also a small island had been planted. Currently there are a pair of swans nesting, they and the other wild foul are working hard to prepare their nests. The Marsh comprises an area of extraordinary plant and wildlife, which is now a major resource for the local residents and for our City. It is a most important natural reserve with no less than 49 different specifies of birds identified to date and more than 70 species of plants, trees and shrubs. -Enhance and develop the amenity and conservation of the extensive flora and fauna. 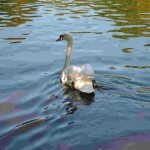 -Provide a safe environment for the extensive wildlife in the area. -Create educational opportunities, School tours being accessible to able bodied & disabled persons. -KKB continues the maintenance of the Fen in conjunction with Fas. The Marsh received the ESB/CVI Community Environmental awards 2001. It was also the national winner for wildlife in the Tidy Towns Competition 2002. The Marsh is designated an area of scientific interest (ASI). The KKB has undertaken in conjunction with Kilkenny County Council and FAS an ongoing phased development at the Newpark Marsh, which is located just off the Castlecomer Road on Lovers Lane to the rear of the Newpark Hotel. 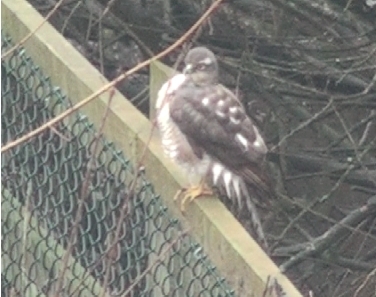 The KKB thank Bird Watch Ireland (Mr Pat Durkin ) who has confirmed that the hawk filmed by the KKB at Dukesmeadow in early Spring was a Female sparrow hawk. During March the KKB distributed a large number trees through out the city for planting by community groups, residents associations and other groups. The KKB wish to thank O’Loughlin Gaels GAA club for facilitating the distribution of trees from their car park on the 12th March 2011. There was a range of tree types including Birch, wild cherry and mountain ash. The planting of these trees will add to the city amenity and will also provide food and cover for wild life. Trees being assembled for distribution by the KKB 12th March 2011. Copyright: Keep kilkenny Beautiful. Composting and gardening wildlife workshop for all ages is to take place on Saturday the 27th November 11am-1pm at the City Library. Come along and explore the world of composting. Learn about the different compost systems available to you and choose the system that best suits your needs. The workshop will introduce in detail compost bins, leaf mould and wormeries. For younger composters make your own ‘compost in a bottle’ to take home and watch your organic waste change into a compost for planting your flowers and vegetables. To encourage wildlife into your garden take home our top ten tips including log piles, nesting boxes and wildlife friendly plants. A sample of live freshwater invertebrates will help you to learn the benefits of garden ponds while our singing garden birds will help you identify your garden birds. This event is organised in partnership between Kilkenny County Council and Keep Kilkenny Beautiful for EU Waste Reduction Week. we look forward to seeing you there! An event to celebrate the Kilkenny 400 Fruit Tree project took place at the Orchard site in Kilkenny Castle on Monday 21st June 2010 . A stone plaque was unveiled by Kilkenny City Mayor Malcolm Noonan . 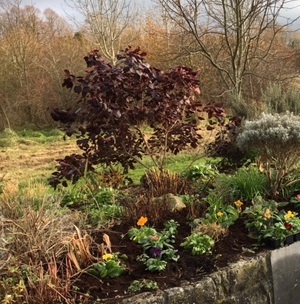 The lives of Susie Long, Barbara Gill, Avril Duffy (Kilkenny Earthwatch group) and Steve Clayton (late husband of Tisha Warner – 400 Fruit Tree project) were also remembered at the ceremony. The attendance included many of the groups and organisations who planted some 40 orchards around Kilkenny in the last year. The KKB have been working closely with Future Proof Kilkenny in developing and implementing this wonderful project. Kilkenny’s 400 Fruit Tree project marked the 400th Anniversary of the Signing of the Kilkenny City Charter by planting 400 native and heritage varieties of Apple, Pear, Plum, Cherry and other types of fruit trees in new Orchards throughout the city and environs. The orchards will improve biodiversity and habitat for wildlife.